I wrote this essay years ago for the Horus Hathor Temple of the Hermetic Order of the Golden Dawn but I think it still stands – at least on a basic level. People often forget that there is an inner aspect to ritual. Many people think if you do the GD ritual as if it were a perfectly performed play it is enough to archive spectacular magical effects. Such people advocate turning the GD into a sort of Masonic order. But with respect to those who do attempt to do Masonic rituals in an esoteric way, the GD is a MAGICAL order were the mere performance of a rite will simply produce a minor effect where there is an overt dependence on the superficial symbols of the rite. If it were all about play acting we would be better off taking part in the Importance of Being Earnest with the local am-dram club. 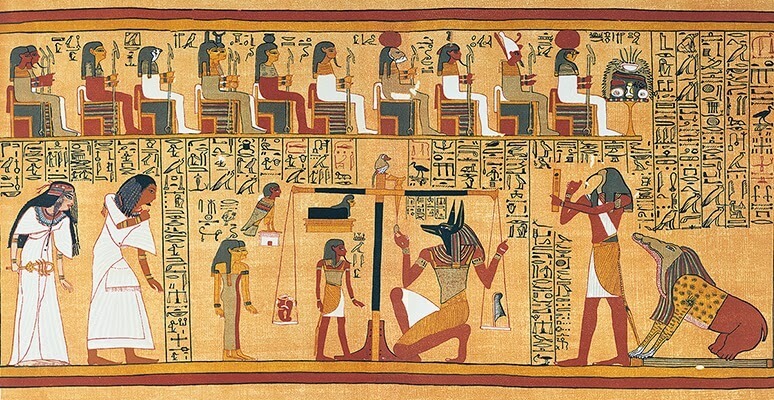 You will have heard me talking about the ritual taking place in the Judgement Hall of Maat, none of this is mentioned in ‘the script’ it is part of the astral or inner workings of the ritual. Too many details about this I cant go into, but these involve the manipulation of different Egyptian godforms in a sort of twilight between the material and the spiritual realms. The Hierophant builds up these godforms and causing them to vibrate at a particularly frequency by using calling their names in an ancient language. This work I find makes it easier for me to see them clairvoyantly during the main working. These godforms are ‘Golden Dawnised’ images of the Ancient Egyptian God in particular colours that are designed to enhance their power in the working. Esoteric teaching says that there are three basic levels to the universe. The first is the material, the next is the astral level which is at right angles to this one and is the realm of imagination and dreams. Finally there is the divine level which is where the realm of the gods and goddesses or just God depending on your tradition. Magical power comes from the divine level and therefore to call power into your rites you need to build an astral bridge between the group on the material and the divine. What the hierophant does along with anyone else who is sitting on the top table in the East is visualising a halfway house on the astral in their imagination. This temple is populated with Egyptian gods and goddesses and these act as channels for divine power. This halfway house is then placed over the top of the physical temple. Some of the Gods are placed over the officers, other are just left passive conduits of power. In the GD this godform work was considered top secret and would only be know to the highest grades in the group. The layout of the Inner Temple and the various depictions of the Gods and Goddesses used were kept in a single coloured scroll or book in some temples and which only those who did the visualising saw. Usually when a temple closed this scroll or book was the first to be destroyed to prevent anyone getting access to the group’s egregore. For this reason anyone can perform rites that have been published, no one can claim to link to the original group. They build new godforms but they will never have access to the original egregore because these will never be the same or visualised in the same way. The godforms provide the halfway force between the Earth and the spiritual forces you wish to attract, but the godforms we have formed does not yet actually draw much force to it. The Heirophant has built a circuit and are is yet to power it up. To do so the Heirophant ascends spiritually to the highest level they can and draws down spiritual energy into the thought-forms created. At the point in the ritual where the Heirophant says: “By names and images are all things awakened and reawakened” you will notice that he does the sign of the enterer but does not do the sign of silence until a few seconds afterwards. It is during this point that he or she is powering up the circuit.